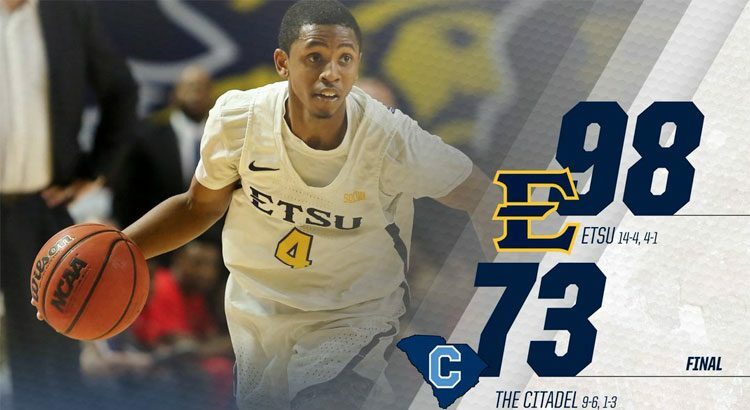 After a somewhat slow start last night, ETSU kicked it up a notch in the 2nd half as they scored 24 of the first 27 points in the 2nd half and poured on a total of 60 points in the final 20 minutes to win in a route over 9-5 Citadel. The win can be attributed to hot 3-point shooting with the Bucs hitting 14-31 3-points shots, good for 45%. Jeromy had his usual double/double with 10 points on 5-9, 14 rebounds, 4 assists, only 2 turnovers, a block and 2 steals. N’Guessan played only 13 minutes, but packed them with 8 points on 3-3 and 8 rebounds. Tray Boyd played only 14 minutes, but used them to get 16 points on 6-12 with 4-8 from 3, 2 assists and 2 rebounds. ETSU improved to 14-4, 4-1, marking the first time in program history the Bucs won 14 of their first 18 games to start three straight seasons. ETSU won 13 of their first 17 games for three straight years from 1948-51. ETSU held one of the best 3 point shooters in D1, Matt Frierson to 0 points on 0-5. Frierson’s had 52-game streak of making at least one three-pointer and was held scoreless for the first time since Feb. 11, 2017 (vs. VMI). ETSU next plays Mercer in Macon on Saturday the 11th. Mercer at 6-10 is better than their record indicates. They have lost 5 games by less than 5 points. Including only losing by 4 at NC state and 4 at Wofford. Mercer is 6-1 in Macon this year.